Today, we’re changing things up a bit. Instead of putting the spotlight one of our employees and their favorite product, we’ve chosen to focus on one of our beloved customers. Lois comes in every week to stock up on almond milk, fresh, organic fruits and vegetables, and a few other natural groceries. Her favorite, though, is wheatgrass! 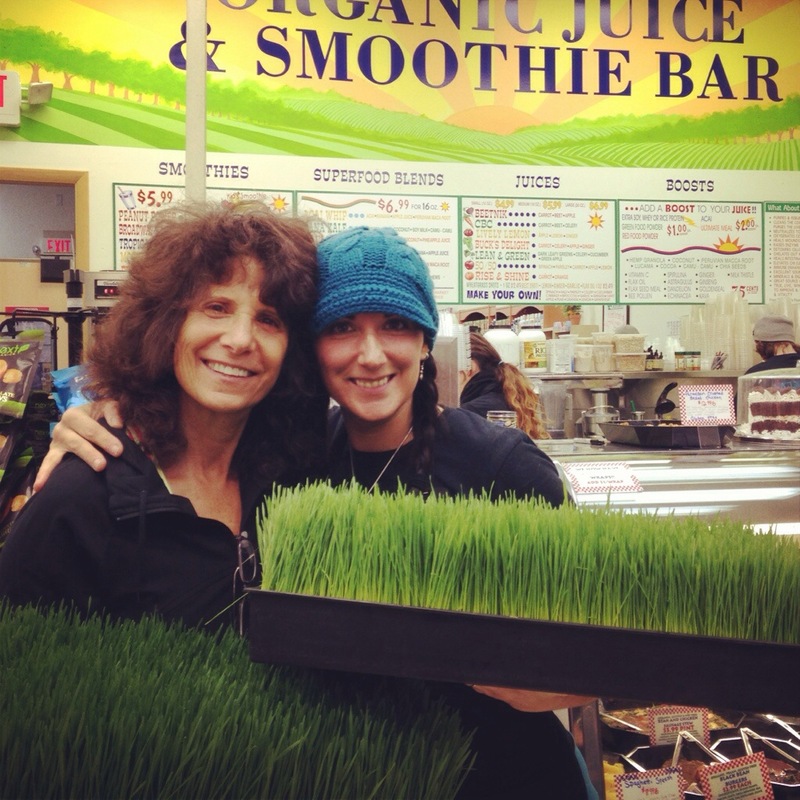 Above, she is pictured with our Organic Juice Bar manager, Lauren, holding a big wheatgrass flat (which we sell for $20, and a half for $10) for home juicing. Wheatgrass is sprouted from wheatberries, the whole kernals of the wheat grain. It has a chlorophyll content of about 70% and a 1-2 oz dosage of its juice (a single shot or double shot at our Juice Bar) is roughly equivalent to eating 2.5 pounds of greens! It is also high in vitamins A and C, helps increase enzyme levels in the body, promotes digestion, is a powerful detoxifying agent, neutralizes toxins, kills bacteria, can help lower blood pressure, relieves constipation, can lead to better circulation, and much more! It is most potent when freshly juiced and taken on an empty stomach. Stop in today to give it a shot! This entry was posted in Customer Pick, Gluten Free, Staff Picks, Stuff We Dig and tagged juice bar, organic, superfood, wheatgrass. Bookmark the permalink.